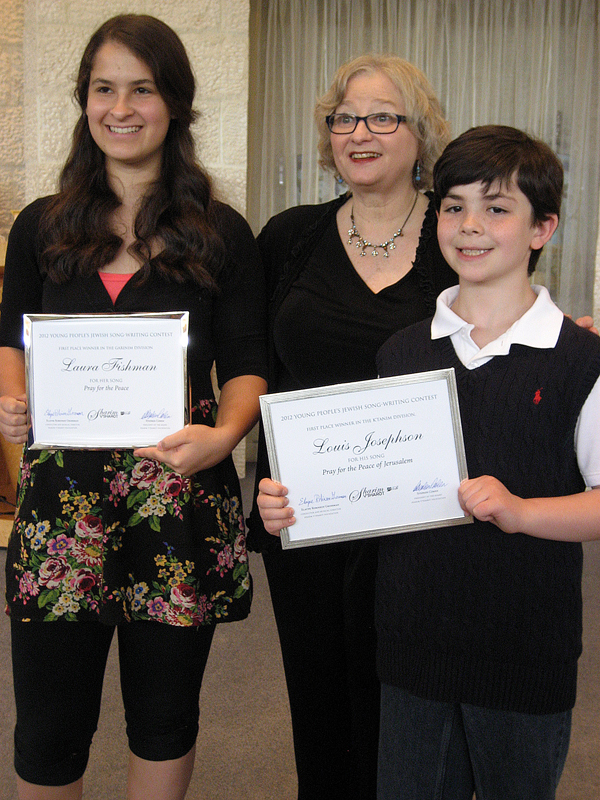 The Annual Young People’s Jewish Song-Writing Contest for children 8–17 and young amateur adults (ages 18–24), with a First-Prize Winner of $72 in each age category, is sponsored by Sharim v’Sharot. The song contest was begun in 2007. Music reaches beyond boundaries and connects one generation to another. Young songwriters are asked to express their thoughts and feelings about Jewish life, events, people, prayers, customs, or writings. Children and Young Adults residing or attending school in New Jersey, Pennsylvania, New York, and Delaware are asked to create original Jewish songs in three age-appropriate categories: 8–12, 13–17, and 18–24. Songs are judged by Jewish-music educators, musicians, rabbis, cantors, principals or teachers employed in Jewish education. Winners are presented to the community, and some of these songs may be performed at a Sharim v’Sharot concert. We will be posting the guidelines and application for 2014 in the near future. 1. Listen carefully to songs that you love. Listen to a lot of songs. Listen closely and ask yourself: What do I like about the songs? How is the song put together? Is there a beginning section, middle and an ending section? Are there verses that are always followed by the same repeating chorus? Does the song capture a mood? 2. Think about the song’s lyrics and how they make your feel. Is this reflected in your song? 3. Speak the song’s lyrics aloud. Do they fall into a pattern? Does this pattern remain when you put the lyrics and melody together? Keep the sounds of the words natural. Do not change accents. 4. Do you have a lively fragment of melody and lyric stuck in your head? If you do, and you can envision repeating this catchy bit of the song, you may have a refrain that you can use after each verse of the song. Or, you might also have the climax or the summary of your song. 5. If you have a more lyrical fragment stuck in your head, you might have a verse, or a part of a verse. You will need to write more of the verse and perhaps follow it with a refrain. Or, you might connect the verse and the refrain with a bridge that brings the verse and the refrain together. 6. Strike a balance between repetition and variety. 7. Your words should sing out. Sing your song out loud. The sounds of the words should appeal to your ear and as discussed above, they should follow the natural accents of the spoken words. The words might rhyme or not. The lyrics might exist first or the melody might exist first. But, the most important thing is that your song should exist as a song before you ever notate it on music paper or sing it into a recording device. 8. If you play an instrument like piano or guitar, give yourself some chords as a background and try to sing your song. If you play a wind or string instrument, make sure that your song is sing able. Instruments can play notes that may be too high or too low for a real person to sing. They can also jump large intervals from one note to another. Singers do not usually do this. 9. After singing your song, determine if the lyrics are grouped into groups of two, three or four beats to the measure. Use this time signature when and if notating your song. 10. Play your song for other people and get their reaction. 11. If your ideas become blocked, go for a walk. Do something else for a while. Let your imagination soar and try again another time. Think of songs that you like. Listen to songs that inspire you.